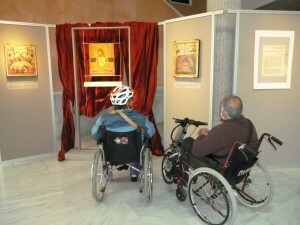 Access for people with disabilities at museums, monuments and to the historical center of Thessaloniki is easier than ever! With the special designed wheelchairs available by the Health Guardians organization and with the help of its qualified escorts, people with disabilities organized can enjoy the beauty and the pulse of the city’s history. Main attractions: White Tower, Umbrellas, parks, the statue of Alexander the Great, the Archaeological Museum, the Museum of Byzantium, the Tower of Hellenic’s Telecommunications Organization, Rotonda, Kamara and Navarinou (walks, photography, visit the inside of those areas if you wish –we design the ride along with you) *. This route is possible only if the weather conditions permit it. For your reservation contact us one day in advance.